Description: Intermodal train 24T rolls through the flour mill complex at Graham. They're about to hit the diamond for the CSX Charlotte Subdivision. Description: WB TOFC, 13th Avenue, 0802 hours. Description: NS 23N is westbound on Main 2 approaching the Porter Co. Line at MP 474 on the Chicago Line. Description: NS 140 heads north up track 2 after meeting NS 285. 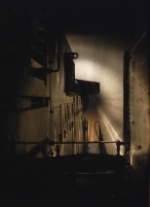 Description: Running long hood forward through the tunnel in a Norfolk Southern Dash 9. Description: Lots of mixed power at the B&M/Guilford/PanAm yard at East Deerfield MA. The main power is from the days empty Bow NH coal train. The rest are Guilford, PanAm, and HLCX units. Description: NS #9086 and its train go pass me and the amtrak station. Description: NS 236 passes through the yard at Bristol as the conductor from V19 waves to the 236 crew. Title: How many NS must pass before one BNSF can go? Description: Engineer Dave Mangold and Conductor Randy English are at the helm.